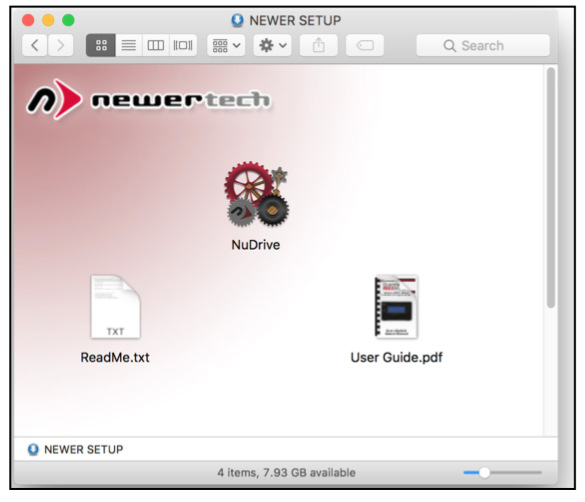 The NewerTech NuDrive is a formatting application built for Mac® and Windows® users who require a simple walk-through of the hard drive or SSD formatting process. 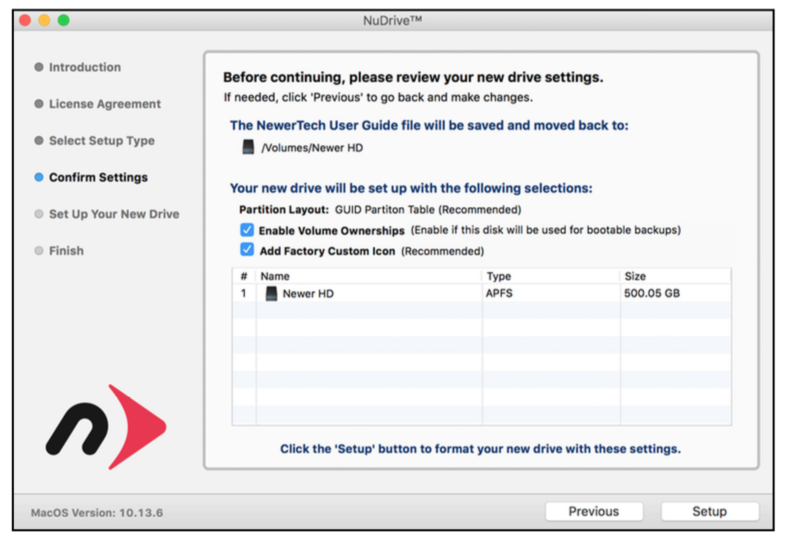 NuDrive uses standard Mac and Windows formatting options to create the volumes needed to store information on your new drive. The benefit is a standard format, created with steps that are easier for many users to understand. Connect your new drive to a power source if needed (consult your user guide if you are unsure), then connect the drive to the computer using the included data cable. Double-click the ‘NuDrive’ icon to open the first setup screen. You will have to enter the password for your user account before the screen appears. Review the User License Agreement (not pictured) and if you agree with the terms, click ‘Accept’ to continue the process. If you intend to format your drive as a single volume, leave the ‘Easy Setup...’ option intact and then click ‘Continue.’ The disk format will be chosen automatically. APFS will be selected for Macs running macOS 10.13 or later; HFS+ will be used for Macs running earlier versions of the OS. 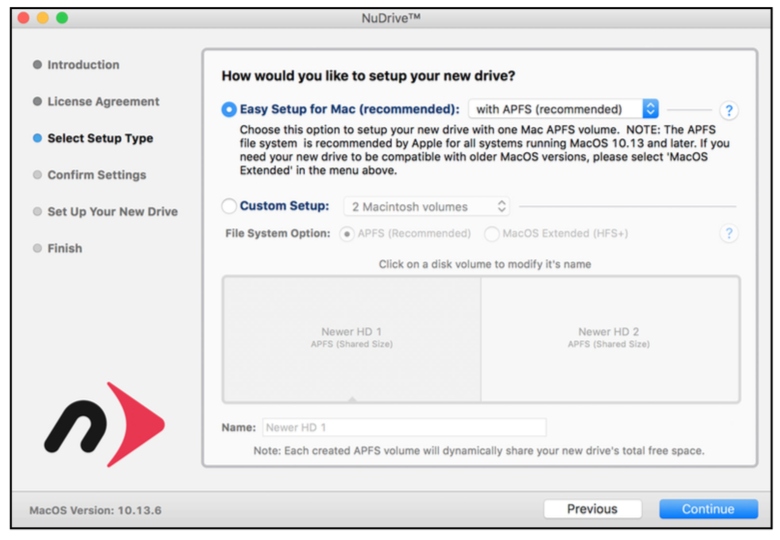 Windows drives will default to NTFS. If you intend to format your disk with multiple partitions or custom settings, please skip ahead to page 5. 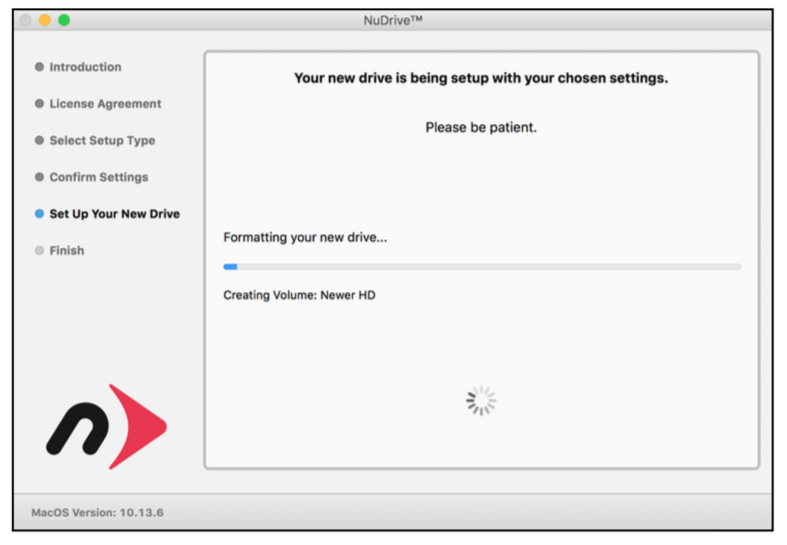 While the drive is formatting you will see a progress meter screen that displays different messages as it progresses. You do not need to do anything during this period of time. 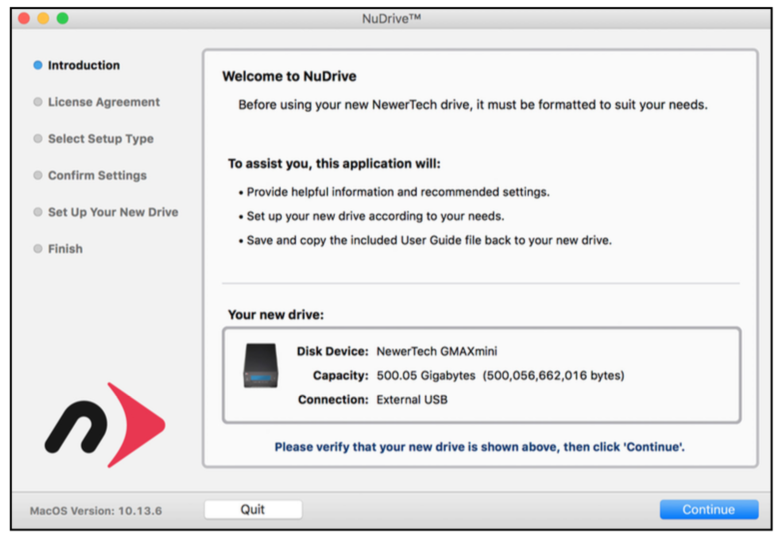 Once you see ‘Setup Complete’, click the Quit button to exit the NuDrive application and begin using your newly formatted drive. To use custom partition or formatting options, click the ‘Custom Setup’ button. For this example we’ll choose the default option to create ‘2 Mac OS partitions.’ On the Windows side this would list as ‘2 NTFS partitions.’ The format will be chosen automatically. APFS will be selected for Macs running macOS 10.13 or later; HFS+ will be select for Macs running earlier versions of the operating system. 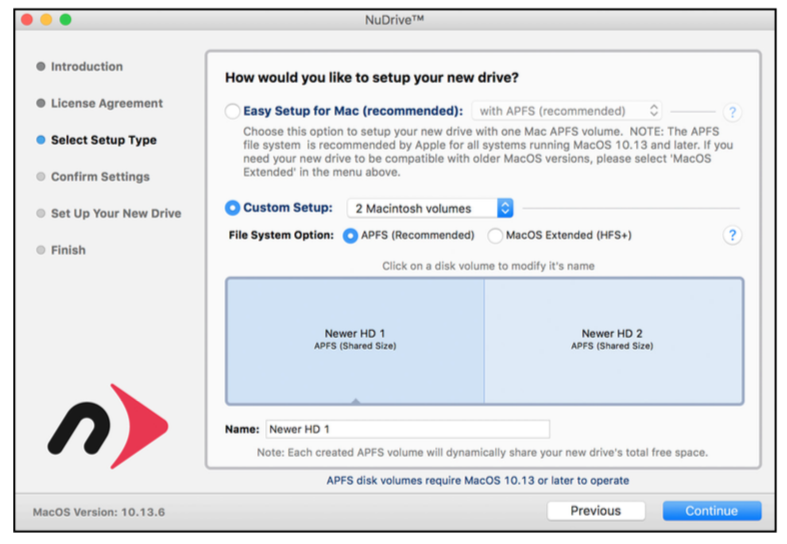 Windows drives will default to NTFS. Click the pop-up menu to the right of the “Custom Setup” button and choose the number of partitions (volumes) you want to create, if you want more than two partitions. To change the size of one volume relative to another, drag the vertical divider(s) in the blue box to the left or right. As one volume is made larger, the other decreases in size by the same amount. 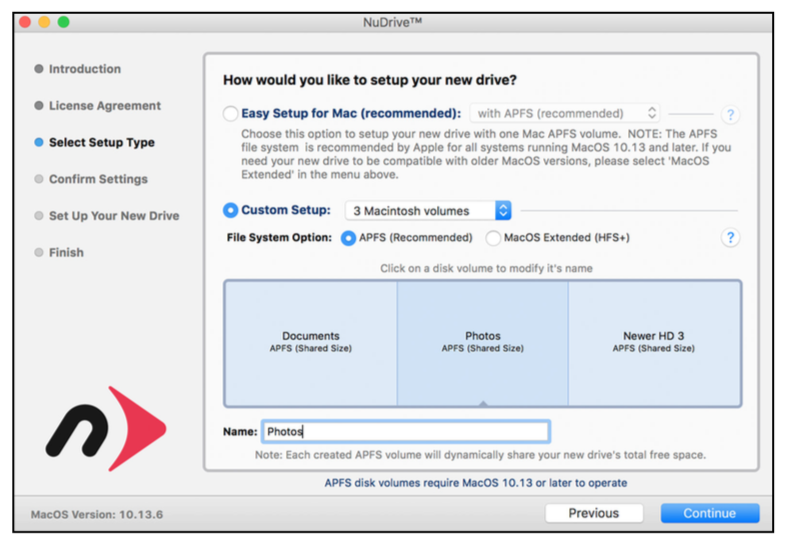 Note: this step is not needed for users of macOS 10.13 or later; the system automatically allocates space for APFS volumes within a disk container. 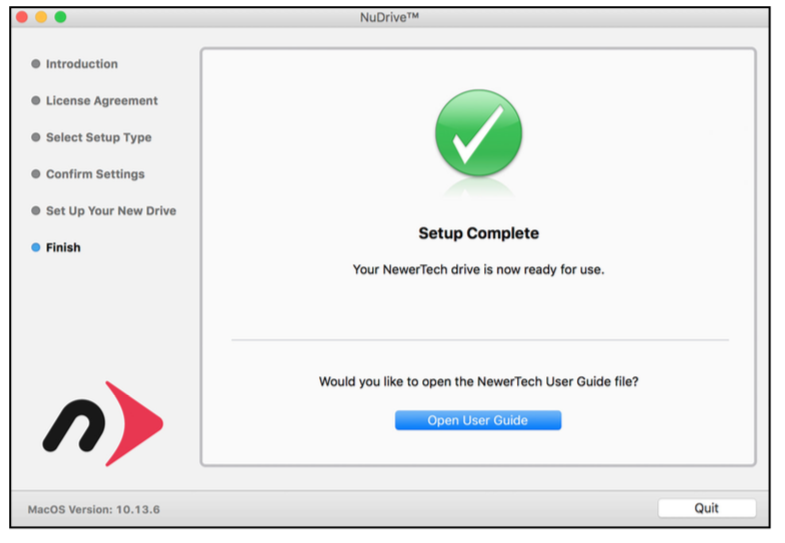 While the drives are formatting you will see a progress meter screen that displays different messages as it progresses. You do not need to do anything during this period of time. 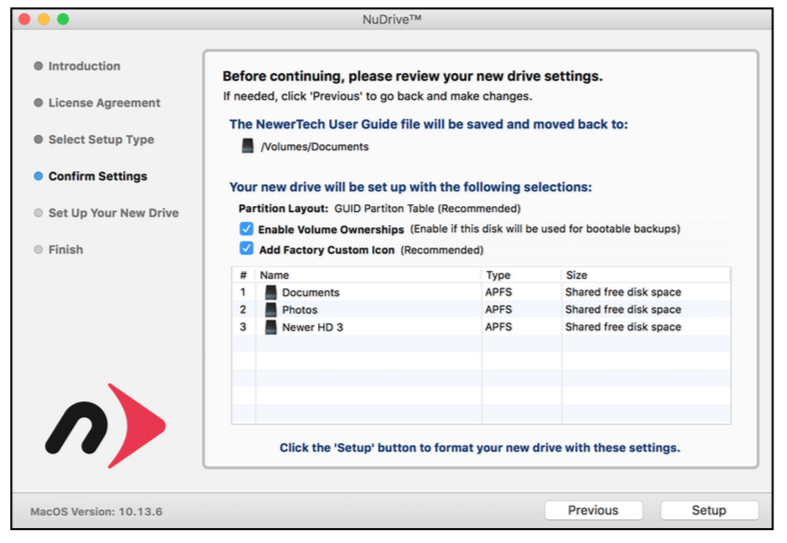 If you would like to like to learn about the settings that Drive Guide uses, or about other methods to format your drives for Mac and PC, please visit the links below.